From the kitchen of One Perfect Bite...Have you ever had a tried and true recipe fail? It happened to me this week when an orange chiffon cake I absolutely adore, and have made dozens of times, collapsed as it cooled. That left me with a pound of redundant rhubarb that was meant for a sauce to accompany the cake. To avoid wasting it, I decided to use it in a simple recipe for gelato, or Italian ice cream. Now, just saying the "g" word is going to open a can of worms. There are many opinions as to what constitutes a true gelato. Some of you will see milk and gelatin in the ingredient list and say "no way." I hope you'll bear with me. It's important to realize that gelato appears in many guises and that the ingredients used to make it depend on local custom. Milk based gelato originated in northern Italy while its milk free counterpart, sorbetto, is a product of the warmer regions of southern Italy. Most gelato does not use gelatin. As it happens, the recipe I'm using today actually has it in the ingredient list. This recipe does not require the use of an ice cream freezer. If you wish to use one follow the manufacturer directions for freezing gelato or sorbet. This gelato is simple to make. My rhubarb was very pale so I added a container of raspberries to enhance the color of the puree. I'm not a fan of red food coloring but it could also be used to enhance color. I make the gelato the night before I plan to serve it. Gelato melts very quickly so plan accordingly. 1) Place rhubarb and water in a 2-quart saucepan. Bring to a boil over medium heat. Cover; simmer until rhubarb is tender, about 10 to 15 minutes. Drain and cool. Place in a blender jar with raspberries, lemon zest and juice and puree until smooth. Strain. Set aside. 2) Place milk and corn syrup in a 2-quart saucepan. Warm over medium heat; do not allow to boil. Add softened gelatin and sugar and stir until sugar and gelatin is dissolved. Stir in the dry milk. 3) Pour mixture into a large mixing bowl. Add the fruite puree and stir until combined. Transfer to an appropriate container and freeze. Partially thaw before serving. Yield: 5 to 6 cups. Sounds yummy. A frozen treat by any name still tastes good! Hi! I just found your beautiful blog. 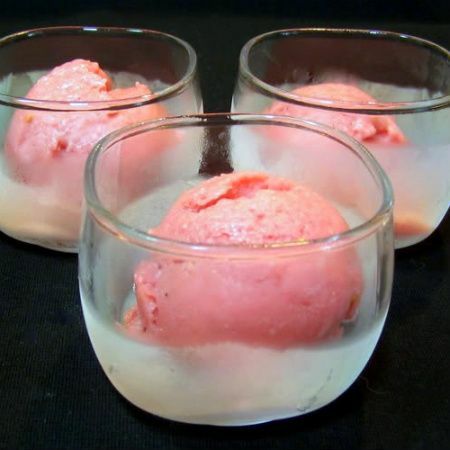 What a great idea to make gelato with the rhubarb that was meant for the cake. Mary, what a treat. I miss the rhubarb I used to grow in Wisconsin..I have found out that gelatin is used a lot in Europe. We have a friend who in his younger years was a master pastry chef in Germany. He taught me his Black Forest Cherry Cake recipe and in order for the whipped cream to hold as a topping, he added dissolved gelatin (in Germany he used the sheets of gelatin) and it amazingly worked beautifully. I thought it was a clever trick. What a clever way to re-purpose your sauce. I am so sorry to hear that your cake collapsed. Organge choffon sounds wonderful! Your gelato looks so refreshing and full of flavor. What a great idea I am sure the combo brings out all of the flavors in the rhubarb can't wait to give this one a try for sure. Hi Carole, I'm so glad you found us. I hope you'll become a regular. Susan, thanks so much for the tip. Sometimes bad things happen for a reason: fallen cake = beautiful gelato. Looks lovely. I don't think I've ever combined raspberries and rhubarb...sounds wonderful. And what a lovely, refreshing spring dessert. My niece makes Gelato professionally in Chicago (sells it to a lot of restaurants here in town). I always tell her if she needs help, I would be happy to do that for her!! She makes dozens of flavors. Yours looks amazing, and that's a flavor she has never made!! Mary, me again. Without an ice cream freezer, do you simply freeze in a flat container and leave alone until serving, or do you 'rake' it ever so often as I have seen done before? Hi Susan, It does not have to be raked but to get more air into the gelato I whip it just as it is beginning to firm. It's not necessary but I think the whipping makes the gelato a bit smoother. Oh Mary, your gelato looks so delicious and mouth watering. Rhubarb and raspberry seem do well together. Milk, no milk, gelato, sorbetto, sherbet and sorbet. It's all ice cream to me and I love it! I think your fruit choices are great, a nice hit of tartness with the sweet. Fionna, thanks so much for including tthis recipe and photo in the Recipes2Share newsletter. I'm thrilled and flattered. Great way to use the spring ingredient of rhubarb! Thanks for this. Hillary, thanks for visiting with us. I hope you'll be back often. My goodness! This sounds amazing! I love rhubarb like crazy! Omgosh so beautiful! I will be using this one. Why do you think gelato recipes have non fat dry milk? Have you tried it without? And yes! Carole is correct, beautiful Blog! bookelf, keeping in mind that I'm not a formally trained cook here's my answer. The dry milk increases creaminess and helps prevent the formation of ice crystals which would spoil the texture of the gelato. I hope you'll visit with us often. I couldn't find corn syrup for this gelato. Can i substitute with liquid glucose instead? is the corn syrup used for firming up the gelato? 1 cup corn syrup can be replaced by 1-1/4 granulated sugar (or light brown sugar) plus 1/4 of liquid (use water or whatever liquid is specified in the recipe you’re using). Lyle’s Golden Syrup (use in same quantity as corn syrup) -- Lyle’s Golden Syrup is widely available in the UK, but possibly harder to find in the United States. Decent sized supermarkets may stock it in the British section of the International aisles, I suspect. Honey (use in same quantity as corn syrup) -- honey is quite a bit sweeter than corn syrup, but if the recipe doesn’t call for a lot of it, this may be an effective substitute. Molasses (use in same quantity as corn syrup) -- molasses is darker, obviously, and also stronger in flavor. It’s also less sweet than corn syrup, so is probably your last resort. If you’re baking something like cookies or bread, I’d suggest you try the honey substitute. Honey, like corn syrup, is hygroscopic. Hygroscopic substances attract water molecules from the air. What his means for baking is that cookies and bread baked with honey rather than sugar will tend to stay softer longer. It is not used to "set" rhe gelato. Am I the only one who omits the powdered milk? I just leave it out the the fancy strikes me and don't really notice any difference beside the lack of powdered milk flavor. i'll try again for sure, Mary. may be without the milk powder this time and give an extra whipping before freezing. the colour of the gelato is a lovely pink.